It’s such a joy to keep in touch with people back in the States on Facebook. 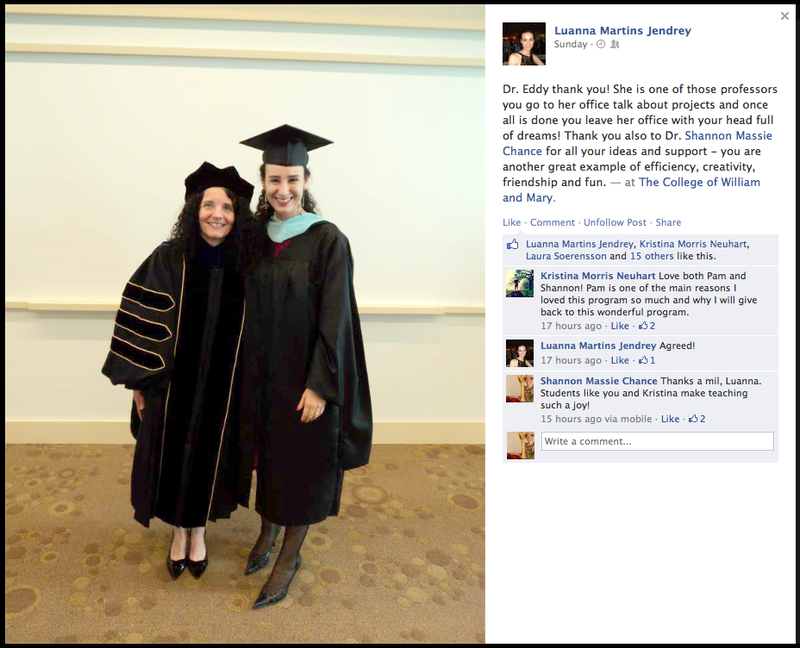 Yesterday, Luanna Jendrey, who took the “Planning for Sustainability” course I offered in the summer of 2011, posted a picture from her recent graduation. The photo was taken with former Fulbright Dr. Pam Eddy, who you’ll recall visited me here in March. Luanna’s kind caption made my day even more special! Kristina Neuhart took the 2011 class, too, and also offered kind words. Congratulations to Luanna on her new Master’s degree in Higher Education! Luanna’s very sweet Facebook post. Shannon thank you – I feel privileged to be part of your blog. And immensely lucky to have been your student! We had such a fun class. I’m glad we’ve kept in touch. I miss getting to see you around W&M.